Beth & Cory's Mom: Should You Hire a Professional Cleaner? 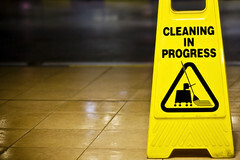 You may have several surfaces that you need to have cleaned. Should you attempt to clean them yourself? Many people try to avoid the cost of hiring a cleaning company by trying to do the cleaning on their own. However, some jobs are just too big for the average person to handle. Also, some cleaning jobs involve the cleaning of biohazardous materials. Obviously, these items are incredibly dangerous and need to be cleaned up in a very specific way. Otherwise, the health of the people doing the cleaning could be put in jeopardy. Here are some of the advantages of hiring a cleaning company. You run the risk of not doing the cleanup correctly if you attempt to do it yourself. This can create additional problems at your home or business that could have been prevented if you had simply called a professional cleaning company in the first place. The pros will take a look at the surface that needs to be cleaned. They will then determine what the substance is that needs to be removed. These two pieces of information will allow them to figure out exactly how they will go about cleaning it off. Different substances require different cleaning chemicals to completely remove them. You might be one of the many people who are concerned about possibly harming the environment with chemicals used in the cleaning process. If this is the case, there are now many professional cleaning companies that exclusively use cleaning products that will not harm the environment. This was not the case 10 years ago. However, the general public has recently expressed a desire to use cleaning products that are safe for the environment and the cleaning industry has responded. Do you need to hire an experienced concrete cleaner? You can get in contact with one by visiting http://actcleaners.com/. You may find yourself in a situation where you have potentially harmful substances that need to be cleaned up. This requires much more than your average cleaning chemicals to do the job right. There is a special protocol that must be taken to ensure that all traces of the substances have been removed from the area. There are special cleaning solutions that need to be used to clean substances like feces and medical waste. A cleaning company will know what to do.